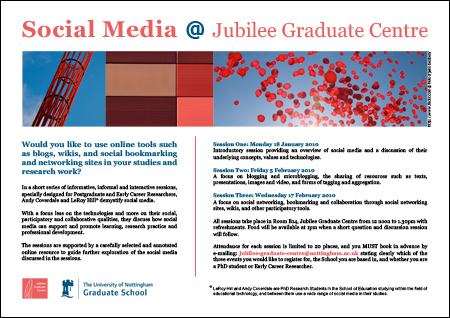 Early in the New Year, I’m running a short series of sessions with my colleague LeRoy Hill on social media for Postgraduate Researchers and Early Career Researchers on Jubilee Campus. The Jubilee Graduate Centre is hosting the sessions and providing facilities and refreshments. Centre Manager Tracy Sisson is enthusiastic about the project and has been very helpful in organising the sessions. We’ve just started publicising the three sessions and hopefully we can get enough interest to fill the 20 places we are allowing for each one. We want the sessions to be informal and quite interactive, and it would be nice to get a mix of attendees from the Schools of Education, Computer Science and Business – could provide an interesting range of perspectives! We are busy designing the sessions and compiling a complimentary online resource with links to tools, tutorials, and and other useful references – lots to do each side of Christmas. Introductory session providing an overview of social media and a discussion of their underlying concepts, values and technologies. A focus on blogging and microblogging, the sharing of resources such as texts, presentations, images and video, and forms of tagging and aggregation. A focus on social networking, bookmarking and collaboration through social networking sites, wikis, and other participatory tools. Early next year, I’m running a short series of sessions with my colleague LeRoy Hill on social media for Postgraduate and Early Career Researchers based at Jubilee Campus. The Jubilee Graduate Centre is hosting the sessions and providing facilities and refreshments. Centre Manager Tracy Sisson is enthusiastic about the project and has been very helpful in organising everything. We’ve just started publicising the three sessions and hopefully we can get enough interest to fill the 20 places we are allowing for each one. We want the sessions to be informal and quite interactive, and it would be nice to get a mix of attendees from the Schools of Education, Computer Science and Business – could provide an interesting range of perspectives. This entry was posted on Tuesday, December 15th, 2009 at 5:35 pm and is filed under Posts. You can follow any responses to this entry through the RSS 2.0 feed. You can leave a response, or trackback from your own site.